Confetti is fun. There isn't really any other way to explain it. It's fun. So when our Christmas tree started looking a little bare, I decided to throw together some Confetti Ornaments to add to our ornament collection. Here's what you'll need to make your own. 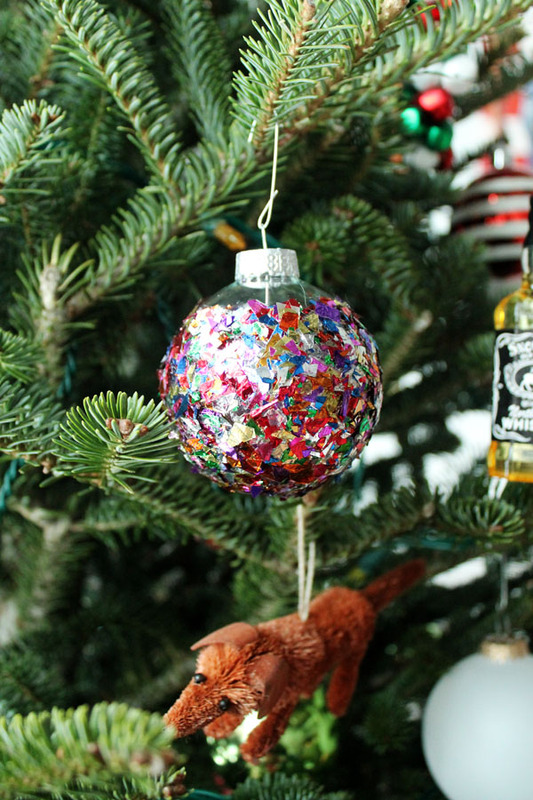 You'll need plain glass ornaments, a package of confetti, Mod Podge, and a paint brush. 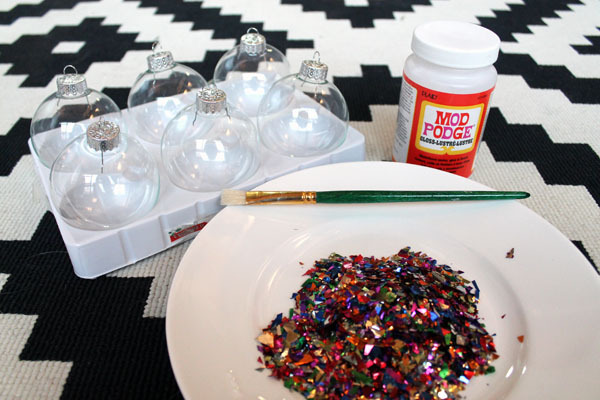 Start by painting a layer of Mod Podge onto the glass ornament. I painted about 3/4th of the way up, leaving the top 1/4 plain, but you can also paint the entire ball. 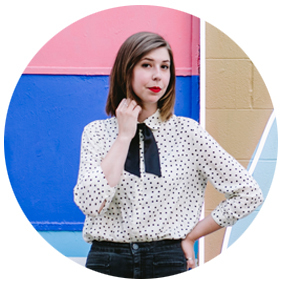 You'll want to paint a decent coat, not too thin. Once painted, immediately roll in confetti and set aside to dry. If you are making more than one, repeat that process again with the other ornaments and let them all start to dry. 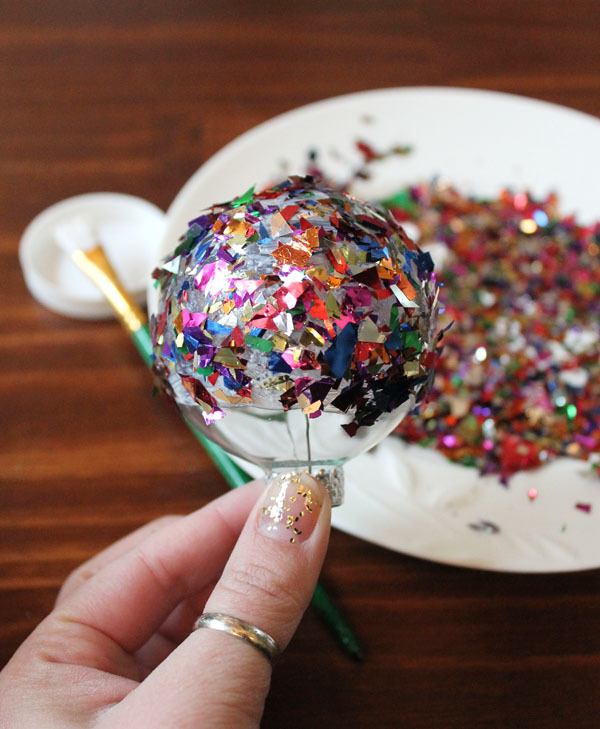 Don't worry if the entire ornament isn't covered and you can still see some glue through the confetti, we are going to add another coat of confetti. 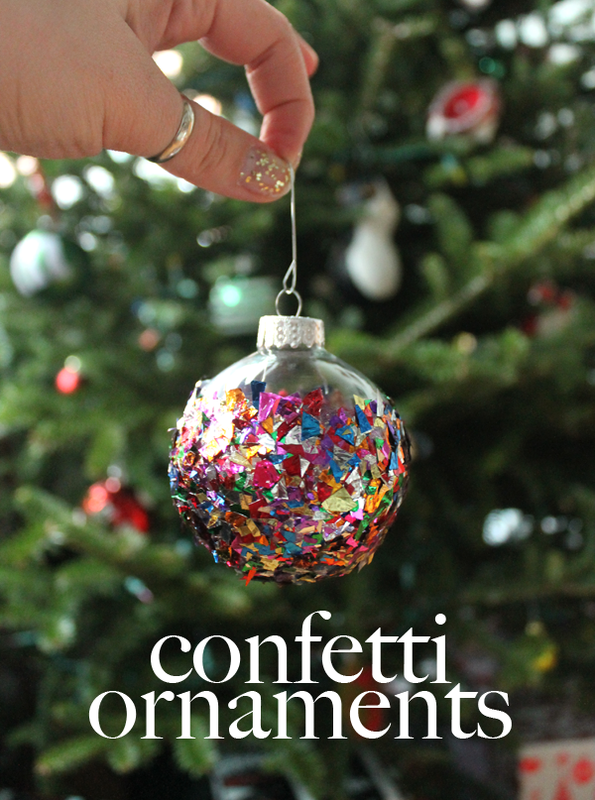 After letting the ornaments dry for maybe 5 minutes or so, add another coat of Mod Podge over the confetti. Don't worry if the confetti moves around, just press the glue and confetti down and try to eliminate any bald spots. 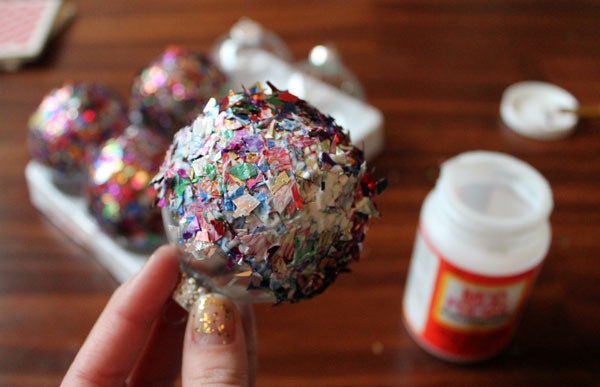 Once you've covered the entire thing in glue, roll it again in confetti and set aside to dry a bit. Repeat with other ornaments. After another 5 minute drying time, coat the ornaments in another layer of Mod Podge. This is the top most layer, so many sure to eliminate any bald spots and let it dry completely. Once it's dried, you will no longer see any white glue, as it will have turned cleared. I let mine sit overnight. I love the way these ornaments reflect both the sunlight during the day and the Christmas lights on our tree at night. Packaged in a nice box, they could also make a great hostess present or an easy gift for someone you just need a little something for.